Life size flag – Jamie, at hands on: as we grow, had this awesome idea for creating a life-size flag. This is on our list of fun for the 4th. We have ordered our own flag, but it hasn’t arrived yet. In the meantime, we borrowed a flag from my mother that has only 43 stars. My mom figures that the flag must have been made from July 4, 1891-July 3, 1892, before Wyoming became the 44th state of the Union. The funny thing is that she has no idea where she got this 43 starred flag! Tie Dye Bunting – red, white and blue tie dyed idea from Disney Family Fun. 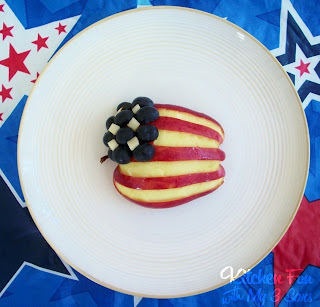 Doesn’t this red, white, and blueberry apple snack look delicious and FUN? I love this creative way to keep the blueberries from falling off the apple. I just found this blog, Kitchen Fun With My Three Sons, and I will be checking it out for inspiration for fun in the kitchen with my two sons. Making a 3 corner hat with some star spangled flair is another activity I know my boys would love. Check it out here. Momtastic shared cute ideas for decorating with oodles of flags- check it out. I love the wreath out of flag toothpicks. Painting in the Pool – what an awesome, messy idea! Put some red, white, and blue (washable!!) 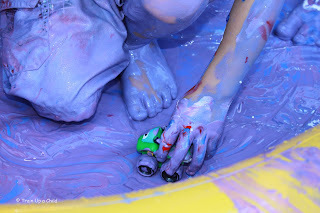 paint in the kiddie pool, add kids and toy cars! I love that this idea went from playing with the cars in the paint to its natural conclusion – a car wash! Martha Stewart even has an idea to get your family pup in on the Fourth of July fun, with an American Flag Dog Bow Tie. 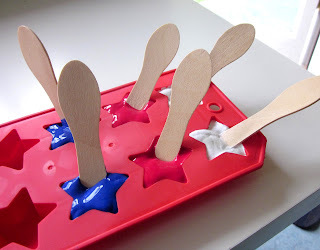 Mama’s Little Muse came up with this twist on painting: put red, white, and blue tempura paint into star shaped ice cube containers, add popsicle sticks, and freeze for some patriotic ice cubes. Another fireworks craft– this time with handprints! I am always up for art projects out of body parts. If you are having trouble remembering the lyrics to your favorite patriotic songs, check here for the words to some of the traditional ones.